The following is a guest post from Becky Whitney of Rub Some Dirt On It. I love shopping at local bookstores, and none more than the Yankee Bookshop in Woodstock, VT. I have found so many hidden jewels in their friendly children section, where they seem to eschew the commercialized mayhem of the typical chain bookstore. 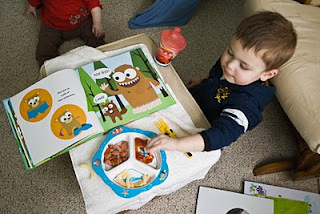 I know that several of my children's favorite books would have never been on my radar if I didn't frequent the Yankee Bookshop, and that is why I created Sandbox Book Club recommendations on my blog: to share these finds with those who don't always venture off the beaten bookstore path. Before I introduce one such finds, let me give you a little background. My two and half year old son is completely uninterested in potty training. There is nothing he cares less about than going in the potty. Recently, however, he did something unprecedented. He actually wore a pair of big boy underwear. He wore them over his diaper, but I appreciate any step in the potty training direction, no matter how small. However, he has only worn them a handful of times since and has pretty much stopped trying to use the potty altogether. I would definitely say there has been a big lull in any progress we had made in this department. Except that we talk about potty training all day long? Why? Because of his absolute new favorite book that we have read no less than twenty times since it came into our home from the Yankee Bookshop. He makes people read it when they come over. It comes upstairs. It goes downstairs. It comes in the bathroom. It goes in his crib with him at night. He is completely obsessed with a book that is covertly about potty training, even though he couldn't care less about doing it himself. The book in question is called, Bear In Underwear. If you have a potty training toddler you should go buy it right now. It has a slight Spongebob-iness to its illustrations, but otherwise I think it's hilarious. And Jax could not love it more. See? Bear (and his buddy Big Foot) join us for lunch. The basic summary is that Bear stumbles upon a backpack full of different types of underwear and he has to find the pair that fit him just right. In the end, he chooses the "tighty whiteys" which is great because they look like little boy underwear, so Jax can relate. I enjoy this book because it has kind of informal diction (word choice). When his animal friends are helping bear choose his underwear and they disapprove, they say things like, "lame" and "dorky." I can't wait until Jax sees my sweat pant ensemble one morning and tells me I look lame! In the end, Bear is happy and all the animals "need" underwear! I hope that some of that urge to wear big boy underwear wears off on Jax! He loves to have them and look at them, but when I ask if he wants to put them on, he very quickly answers, "No!" 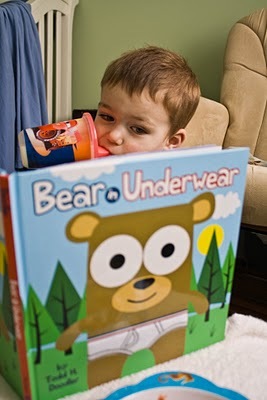 I tell him that Bear likes his underwear, which seems to sway him for a minute, but then he shakes his head once more. Hopefully, Bear will be instrumental in our fight against diapers, and I can put some of that diaper money toward more books! And in case you have a little girl, there is Bear in Pink Underwear, too! I can't vouch for it personally, but I'm sure it'll be as big a hit with your little girl as this one is for my little guy!